The suit, filed by the group Citizens for Two Voices, seeks injunctive relief from the deal, known as a joint operating agreement (JOA), that the two papers' owners hammered out last fall. Among the most dire provision in the deal is a revenue-sharing agreement that sliced the Tribune's share of print revenue profits from its traditional level of 58 percent to 30 percent. The Deseret News, meanwhile, will receive 70 percent of the profits. Former Tribune journalists have said the deal violates antitrust laws, and the U.S. Department of Justice has confirmed it is investigating the deal on these grounds. But the time line of this investigation is unknown, and until it does conclude, Tribune supporters fear the paper could crumble. “This lawsuit is brought in part to enable the Tribune to remain in operation pending the conclusion of the DOJ's investigation and decision-making process,” the suit says. Accompanying the lawsuit are affidavits by former Tribune Editor Nancy Conway, Utah State Sen. Curtis Bramble, R-Provo, G. Donald Gale, a former executive for KSL Radio and Television, which is also owned by the LDS Church, Jeffrey Miller, an advertising executive for Mark Miller Subaru, a major newspaper advertiser, and Joan O'Brien, a former Tribune reporter who has spearheaded Citizens for Two Voices. In her affidavit, Conway, who was the editor until September, 2013, says the new JOA “handicaps” the Tribune. The JOA dates back to 1952, when the two papers, along with several others across the country, combined the advertising, distribution and printing wings. This allowed the papers to collude, and in the spirit of preserving newspapers, be exempt from federal antitrust laws. This prevented the papers from having to compete against one another, which often led to papers undercutting each other out of business. Although the JOA has been renegotiated a number of times over the years, its most recent iteration, critics say, is nothing short of the Tribune's obituary. In addition to giving the lion's share of the print advertising profits to the Deseret News, the agreement also involved the sale of the Tribune's interest in the printing presses. For the profits and the presses, the suit estimates the Deseret News paid the Tribune's hedge fund owner, Alden Global Capital, upward of $15 million. Additionally, the new JOA gives the church-owned paper veto power over an ownership change at the Tribune. The suit also seeks to invalidate this clause. The suit claims that the Deseret News vetoed an effort last year by businessman Jon Huntsman Sr. to buy the Tribune. And it states that interest from other parties, like the McCarthey family, which for more than a century was a key part of the paper's ownership puzzle, have been stifled by the new JOA. 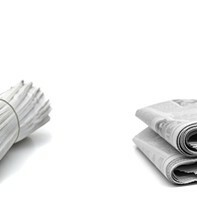 Digital First Media manages Alden Global's dozens of large newspapers and hundreds of smaller media outlets across the country. Earlier this year, Digital First shuttered a large news gathering operation in New York, a sign that some media pundits said indicated the hedge fund was preparing to sell off its media assets. With shrinking print readership and diminishing profits, the Tribune has weathered the digital storm facing the publishing business with mixed results. It has cut scores of jobs over the years, and in the past year alone, has shed 27 newsroom jobs. Even so, the suit says the paper, with 58 percent of the profits, could remain viable and even profitable. In 2010 the Deseret News turned its attention toward catering to its national and global Mormon audience, taking its eye off local news and zeroing in on stories of faith and religious liberty. Part of this shift involved laying off 43 percent of its newsroom staff, filling the gap on local coverage with volunteer journalists. A call to Deseret News CEO Clark Gilbert seeking comment on the lawsuit was not immediately returned. The full text of the lawsuit and the affidavits can be found at www.utahnewspaperproject.org.